Everyone's favorite Thanksgiving dish can be made without canned cream of mushroom soup and all the preservatives that go along with that, thanks to this recipe! It starts with a homemade "cream of mushroom soup" cooked with fresh green beans in the pressure cooker, and then it is topped with freshly browned bread crumbs instead of the canned fried onions. You will have all the flavor and comfort of the traditional green bean casserole, without opening a can! Set pressure cooker to Sauté setting on Normal heat. Melt 1 tablespoon unsalted butter in steel pot of pressure cooker. Add panko bread crumbs, ¼ teaspoon salt, and a pinch black pepper and stir until bread crumbs are golden brown, 2 to 3 minutes, watching them carefully so they don't burn. Transfer bread crumb topping to a bowl and wipe out steel pot. Return steel pot to pressure cooker. Melt 4 tablespoons butter in pressure cooker set to Sauté on Normal heat. Cook onion, mushrooms, and garlic until soft, about 5 minutes; stir in flour until mixture is thick and pasty. Stir chicken broth, heavy cream, and soy sauce into onion mixture, using a whisk if needed to remove any flour clumps. Continue stirring until thickened, 1 to 2 minutes. Stir green beans, ¾ teaspoon salt, ½ teaspoon pepper, and nutmeg into onion mixture. Lock pressure cooker lid in place and set steam vent to Sealing. Select Pressure Cook (Manual) and cook for 5 minutes on High Pressure. Press Sauté button and cook on High until liquid has reduced to the consistency of cream of mushroom soup, 3 to 5 minutes. It will also thicken as it cools. Transfer the entire casserole to a dish and add bread crumb topping or serve directly onto plates and add bread crumb topping. This can easily be turned into a vegetarian dish by substituting vegetable broth for the chicken broth. You can use fresh or frozen green beans for this dish. If using frozen, defrost them at room temperature for about 10 minutes before cooking. Per Serving: 358 calories; 25g fat; 28.7g carbohydrates; 8g protein; 71mg cholesterol; 753mg sodium. This was delicious. I don't like mushrooms at all. This is very tasty, my new favorite green bean casserole dish. The breadcrumb topping is fantastic. I reduced the broth by 1 cup, used coconut cream (cream, not milk) and coconut aminos as a swap. I reduced the cooking time by one minute, placed the beans in a casserole dish and grilled/crisped those gluten free panko crumbs. Yes, it was slightly sweet, but not in a bad way. We will do this again and add more garlic/onion to crisp. Thanksgiving will be so good this year. We make the veggies the stars of our Thanksgiving meal. This tasted pretty good but but the liquid didn't reduce and thicken like it should have and the beans were overcooked because I had to cook them so long. I'm going to use the leftovers with the leftover turkey and heat it in the oven. I think I will reduce the amount of broth next time I make this. 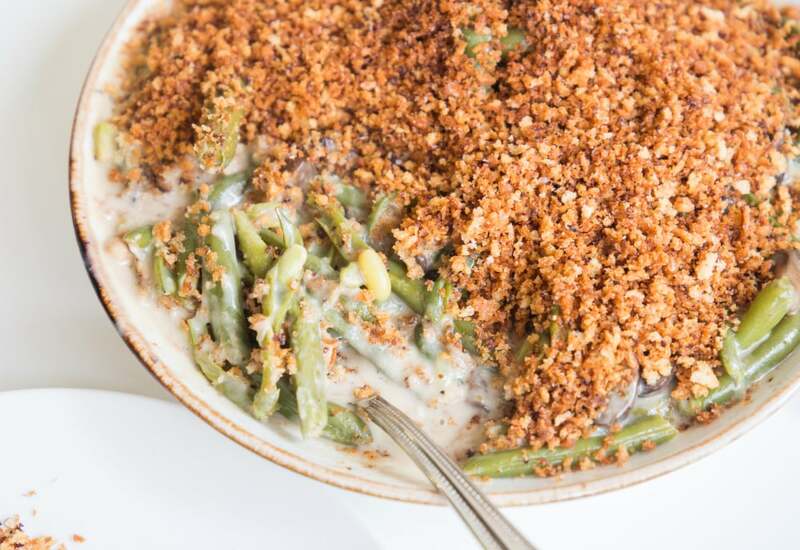 This recipe reminds me of my grandmas classic green bean casserole. She would not believe me if I told her I made this in a pressure cooker. It was ready in under 30 minutes, which is a win for me. I'll definitely be bringing this to Thanksgiving dinner. You had me at frozen green beans! There's no shame in my frozen veggie game and I'm so happy to have found a recipe that makes it work wonderfully. This is a great side dish for Sunday dinner and it took me under 30 minutes to make. Soy sauce and nutmeg may seem out of place, but I used both ingredients and believe the recipe as a whole came out fantastic. Bonus: the bread crumb topping! My husband loves green bean casserole but I hate the time that goes into the traditional version. Tried this Mealthy version, came out great, no issues and wayyyyy faster! Sprinkled with those French fried fried onions because what’s a green bean casserole without those?! So good!! I cut back on the broth and cream amounts so the sauce was thick enough immediately after removing the cover but it had begun to burn on the bottom.